The second video below looks strikingly similar to the second video in this post. I guess what works at one mile-wide, inch-deep, entertainment-driven “church” to herd goats, must work at another. So what could be worse than kidnapping the Easter Bunny, physically battering him, and spitting in his face? Well, the “church” staff performing their own rap video in which they shake their rear-ends for the camera is a close second. 1). Two thousand years ago a handful of men began to spread the Gospel of Jesus Christ around the world. How did they possibly achieve this without employing such cool, hip, and relevant means as seen in these videos? 2). I can’t help but think of the man who was just diagnosed with terminal cancer and is about to leave behind a wife and children. He realizes that his life has been one of sin and an affront to a holy God. He thumbs through the yellow pages with a heavy heart as he tries to find a church. He knows that if he died he would go to Hell . . . this much he’s sure of. He’s a dying man looking for answers. He stumbles across Ridge Stone “church” (the one who produced these videos) and attends the following Sunday. He seats himself at the front as a man desperate for answers with time against him. The lights dim. The video screen begins to light up. The above Christmas Eve promo video is shown with the “church” staff wiggling their butts for the camera and he inwardly asks himself, “Is this what Christianity is all about?” He leaves at the end of the “show” and this is the last “church” service he ever attends. Now imagine if you will; what if you were that dying man? This juvenile display of intimacy with the world and its culture is the fruit of an apostate false church, not the spotless, unblemished Bride of Christ. Make no mistake, this social-club masquerading as a church (and those like it) are an abomination unto a holy and righteous God. 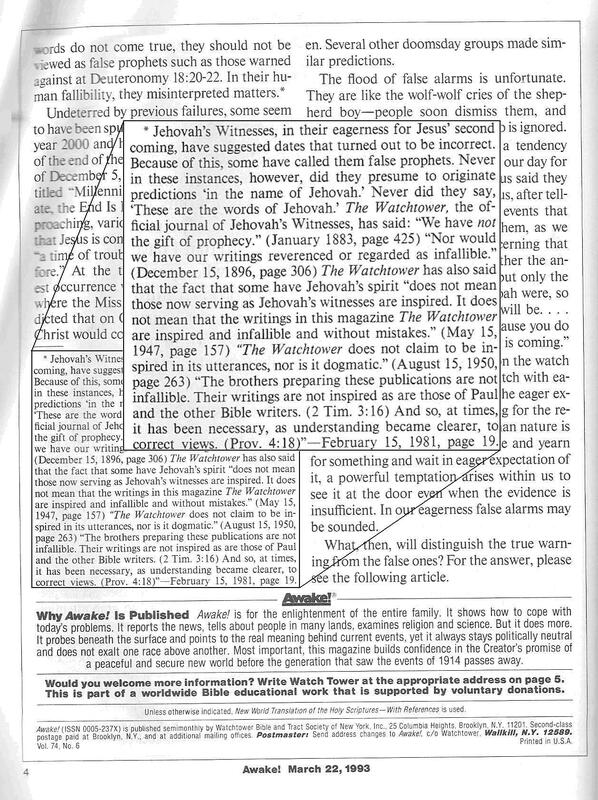 Dear Jehovah’s Witness: Is the Watchtower Bible and Tract Society an inspired prophet of God or not? Is the Watchtower Bible and Tract Society an inspired prophet of God or not? Yes: They claim to be prophets of God. No: They deny that they’re inspired. 1). How can you claim on one hand to be a prophet of God, and yet deny being inspired? 2). If the Jehovah’s Witness organization is an inspired prophet of God, then how do you explain the countless false prophecies and doctrinal flip-flops made by a supposed “inspired” organization? If it is not inspired, then what is the final authority for the rank and file Jehovah’s Witnesses? Check out more Contradictions in Watchtower Theology at CARM.